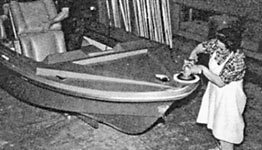 The following stories chronicle the construction of a c.1968 Silver Line boat from concept to completion. 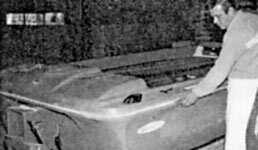 Written by retired Fargo/Moorhead newspaper columnist Stan Cowen for the Silverline employee newsletter called "Shop Suey," these articles and more were reproduced later in a booklet titled, "The Silverline Story." Like a child who was once just a gleam in its father's eye---that's how a Silver Line boat is born. Seeing those beautiful, luxurious finished boats leave the plant of Silver Line, Inc., bound for all part of the United States, even many of our own employees who have played an important part in their making have little knowledge of how a particular design came into being. That's why, casting about for material for another in the series of articles on various company departments, we decided that the best place to start was at the beginning of the boat factory. Our executives, from President John Buckman on down, are constantly on the lookout for new ideas to keep Silverline up front among the nation's boat manufacturers. An idea may sprout from a competitor's design that could be improved upon or the brain child of someone with many years of experience in the boat business. At any rate the idea for a new boat is developed. 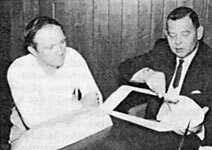 So Mr. Buckman [right] and Don Sundquist, our plant superintendent, sit down and talk about it, attacking the problem from every conceivable angle. Artists and draftsmen get their heads together and come up with a sketch of what they hope will be a new model that will stand the boat industry on its ear. An experimental hull is built. Using plywood and putty, the hull is fashioned into the design desired. This is called a "plug." Of course the design must then be proved out. An engine is installed and the "plug" is taken to a lake. People who see this strange craft which almost, but not quite, resembles a boat, might think that somebody has rocks in his head. But it is actually in this test, or series of tests, that the proof of the pudding is revealed. Maybe the craft "porpoises;" perhaps it doesn't get out of the water fast enough; doesn't possess the desired riding qualities; doesn't plane properly or lacks stability. All these, plus the ultimate in safety and comfort, are prime requisities for every Silverline boat. Whatever is lacking, the "plug" is returned to the factory and changes are made to meet the requirements. This process may mean several trips to the lake. Last year, for example, on one boat alone it required four trips and as many changes to come up with a design that was second to none. When the design has proven satisfactory to everyone concerned the "plug" goes back into the mold room. Here the "plug" is given its final finish, sanded and polished to a beautiful glazed surface which ultimately will emerge as a gorgeous new Silverline boat. This job finished, the "plug" now becomes a "pattern" from which the mold will be made. The mold, of course, is the beginning of the finished product from which hundreds of boats of this particular design will be made. First, the pattern is sprayed with a heavy, thick coating of Gelcote, a coloring agent. Over the Gelcote coating high quality fiberglass of Silverline's own formula is sprayed. When the fiberglass is "cured" you have a mold which is pulled from the pattern, Gelcote color and all. The mold is then taken to the lay-up department where the process is reversed. Instead of making a mold out of a plug, we make a boat! First the mold is sprayed with Gelcote in the color desired for this particular model. The color and fiberglass form a solid bond that doesn't deteriorate or "weather." This process takes place in the paint booths, where the boat decks are treated in much the same manner. Also, molds are made for the motor boxes used in the stern-drive models. In the lay-up department there are four "guns" operated by experienced hands. 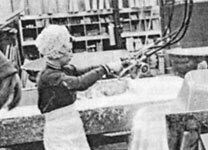 After the hulls and decks leave the paint booths, a mixture of fiberglass, Gelcote and a catalyst agent is sprayed by the "guns," forming a solid, virtually indestructable bond. The lay-up department now operates 24 hours a day, six days a week! Those "guns" are themselves a marvel of invention. A fiberglass thread, which looks something like a white clothesline, is fed into the "gun," is chopped up into tiny bits and mixed with resin and the catalyst. Then another fiberglass material called "roving" which is also white but comes in sheets which look something like woven rattan you've seen on chairs, is placed where added strength is needed. The "roving" is cut into shapes and sizes as required, and of course this, too, is sprayed with fiberglass from the "guns." Then comes the final step for both the hull and deck. A sub-floor of strong wood has been placed in the hull and all of this is sprayed with fiberglass, making a tough, permanent bond. Other wood parts to which hardware is to be attached are put in place and a second wood floor is built. Between the sub-floor and the main floor an air chamber is created---an additional floatation feature. Holes are provided, of course, to drain off water which has accumulated in the air space from condensation and the bilge pump takes care of the rest. Thus, the creation of a newly-design Silverline hull and deck has been completed and the boat is ready for assembly. The whole business is again glassed in, making the entire hull or deck one solid piece, providing great strength as well as beauty. And that will be the subject of our next in this series. We left you after the two major parts of the boat, the hull and deck, had gone through "lay-up," where they were sprayed and reinforced with fiberglass and wood, ready to proceed further along the assembly line. In this article we'll take you on the trip toward the finish line, where the gleaming, beautiful boat is ready to be shipped to dealers and customers throughout the land. You'll recall that the boat hull was pulled from the mold by electrically-operated lift. Likewise, the deck was lifted from its mold by hand. Both the hull and the deck are then weighed to in-sure that the right amount of material has been used. The hull and deck are then taken to the sanding booth where all of the rough spots or irregularities are smoothed out so that when interior material is installed, the highest-quality finish is obtained. Incidentally, the deck previously was sanded in the deck-rack department, but this operation has now been moved to the sanding booth which is especially equipped to keep down the dust. In the sanding booth, too, a fiberglass template is used to mark the spots where holes are to be drilled for the various attachments. Leaving the sanding booth, the hull and deck go their separate ways. 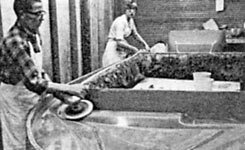 The hull, which has been placed on a dolly, where it will remain through the rest of its trip through the plant, next goes to the vacuum cleaning department, where a powerful vacuum extracts all of the fine dust. Then comes the panelling material for the interior. It may be fabric, carpeting or matting, depending upon the model, which is attached to the interior of the hull with contact cement. The parts that are not covered with panelling are painted with gelcote, a sticky plastic material which produces a permanent, hard finish. Then aluminum trim is fitted around the seat boxes. While all this has been going on, the deck has taken a different route. It has gone to the deck rack, where various types of hardware is attached, like cleats, bow light, step pads, air scoops, aluminum trim, glove compartment, instrument panel, steering column, control cables and wire harness. Then the hull and the deck come together. 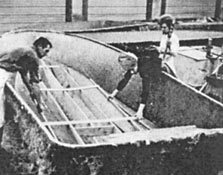 The deck is placed on the hull, where it is fitted to exact measurements. The two are then clamped together and an air-driven staple gun, using stainless steel rust-proof staples, fastens the two together. The staples are placed every six inches to insure maximum fit, although this is only a temporary bond. Then the boat goes to the glass rack. It is lifted by hydraulic jacks, flipped upside down and placed on "horses." The crew then goes to work from inside and underneath to fit a fine fiberglass matting to the inside of the "lip" formed by the joint. The matting is covered by resin and the boat then stands for an hour or so until this material is properly cured. While the hull is in its upside-down position it undergoes a thorough inspection. (Here again, as on its trip through the entire plant, quality control is most important). This particular inspection may be a revelation to the uninitiated. Actually, every inch of the hull is gone over meticulously to make sure there are no flaws. For nothing is left undone to insure that the top most quality is attained and that the Silverline boat coming off the finish line is up to the highest Silverline standards. This task completed, the boat again is flipped over and placed back on its dolly, where it will stay until completed. In the next step, the "lip" which was used to fasten the hull and deck together is cut off. Then, extruded aluminum gunneling is put in place. Using a template, the crew has drilled the holes where stainless steel T-bolts are used to attach the gunneling. These bolts, are rust-proof. Next comes the interior finishing. The colored vinyl upholstered seats called for in this particular model are put in place and securely bolted. Side shelves are installed, miscellaneous hardware, such as stern lights, is put in place; gas tank, engine cover and other finishing materials attached. Next come the windshield and custom-fitted top. Each boat has its own windshield and top which are matched according to serial number, insuring a good fit. The windshield and top are shipped with the boat. Then comes the final cleanup and inspection. No scratch or other defect is allowed to pass. If any are found, back it goes with an order that the job be done right! The boat is buffed from bow to stern, coming off the line as a craft which will uphold the reputation of Silver Line as a top-quality product. An inspection team then proceeds to "buy" the boat. And like the most discriminating customer, a boat is either accepted or rejected. If accepted, the inspection team signs the inspection tag which goes with the boat to the new owner. 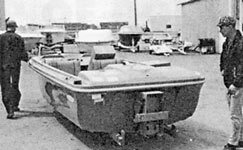 Meanwhile, if the particular model is a stern-drive, the boat as it leaves the glassing department goes to motor installation, where the world famous MerCruiser, OMC or Chrysler stern drive unit is installed, together with battery, power tilt and electrical wiring. Thus a Silverline is ready for the water. Into it has gone the conscientious workmanship and pride of every employee of Silverline, Inc.